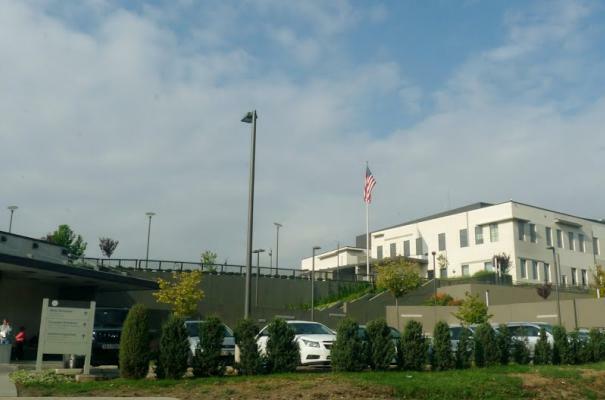 Coordinates: 42 ° 0'35 "N 21 ° 25'38" E.
The US Embassy in Skopje, the capital of Macedonia, occupies a territory incomparably larger than other, similar areas of US embassies in other Balkan countries. The complex of buildings is placed in a strategically convenient location on a hill in the outskirts of the city. In addition to the immediately visible structures of the main building, the complex features four underground floors. The Vardar river basin occupies two-thirds of the territory of present-day Macedonia.